Pre- and Post-Storm Lidar Topography: Comparisons of beach elevations measured before and after the storm quantify magnitudes of coastal change resulting from Hurricane Irene. Pre- and Post-Storm Photo Comparisons: Before and after photo pairs show examples of extreme coastal change resulting from Hurricane Irene. Post-Storm Photos: Photography covers the region from Ocracoke, NC, to Virginia Beach, VA. View photos. 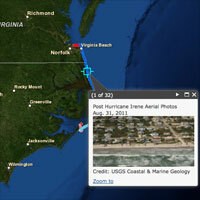 Hurricane Irene made landfall just west of Cape Lookout, NC, on 27 August 2011 as a Cateory 1 hurricane. A second landfall occurred in the early morning of 28 August near Little Egg Inlet, NJ, as a Category 1 hurricane. The U.S. Geological Survey (USGS) Hurricanes and Extreme Storms Group is investigating coastal change caused by major storms and is responding to this event by acquiring new observations and updating an analysis of coastal changes. Aerial photography and laser altimetry will be collected to document beach morphology and the response to this storm. Comparisons of pre- and post-storm data will be used to show the nature, magnitude, and spatial variability of coastal changes such as beach erosion, overwash deposition, and island breaching. These data will also be used to further refine predictive models of coastal impacts from severe storms.